Way too sweet. Using orange juice over water adds extra sugar/calories and taste that takes away from the tart nature of the cranberries. I would also recommend less sugar. 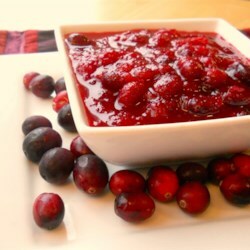 No reason to take healthy cranberries and ruin them in a sugar-laden sauce.